You want a vacuum cleaner that is totally without compromise, be it for wet or dry use, and that’s exactly what you get. Please call our office on 01473 636663 for more information. You want a vacuum cleaner that is totally without compromise, be it for wet or dry use, and that’s exactly what you get. One minute (or most of the year in the majority of cases) Charles will be up to his neck in dust and dirt, keeping everything spick and span, and then suddenly the call arrives and he’s expected to unblock the sink or dry the floor. 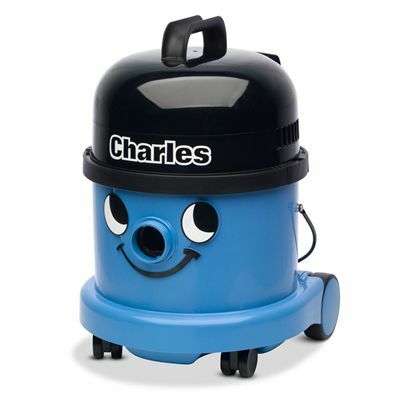 Well, it’s no problem with Charles, he has our full Twinflo’ motor and performance to give you exactly what you need. Big filters and Hepaflo dust bags for dry use and a safety float valve for wet pick-up. Tubes are lightweight aluminium and will never rust. Two floor nozzles, one for wet work and a superb combination nozzle for carpets and hard floors, and even that has a stainless steel high efficiency carpet plate. Add to this three smaller tools and you are ready to tackle almost anything that comes along, be it floors or floods, corners or curtains, you are in control. Having a Charles about the house is like having an insurance policy but without the small print.